We live in an age of information. At the touch of a button we can access a world of information on nearly any given topic. While there are certainly advantages to this, the fact remains that having lots of information isn't the same as having wisdom. Sure, we may be able to write a research paper for school more easily and even self-diagnose a health issue, but that doesn't mean we know how to live wisely. Ultimately, wisdom isn't about knowing something, but knowing someone-Jesus-and how He transforms our hearts and helps us to live and act wisely before others. Grounded is an eight-session Bible study designed to guide students to a holistic understanding of biblical wisdom. Building on themes in Proverbs such as wise counsel, the heart, relationships, actions and attitudes, work, money, and the power of words, each session is supported through practical application found in the Book of James. Throughout the study, authors Clayton and Sharie King uncover not only what the Bible has to say, but practical advice on how to live wisely in each of these areas. Also included: Thirty days of devotional material are included in the back of the book to help students continue the practice of daily Scripture reading after they have completed the group Bible study. Provides an in-depth study of two books of the Bible. Students will understand the importance of applying biblical wisdom to decisions they make every day. Guides students in the discipline of daily Bible study. Clayton King serves as a Teaching Pastor at NewSpring Church in Anderson, SC. In addition to his leadership role there, he spends his time traveling, preaching and speaking in churches, conferences and leadership events, as well as running Crossroads/Clayton King Ministries. He is married to Sharie, and they enjoy working, writing, and speaking together. Sharie King married Clayton in 1999. She's the co-founder of Crossroads Summer Camps and Clayton King Ministries. Sharie blogs regularly at sharieking.com and hosts a podcast called Overcoming Monday. She and Clayton have two sons, Jacob and Joseph. 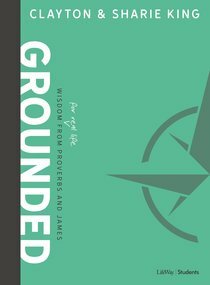 About "Grounded: Wisdom For Real Life From Proverbs and James (Bible Study Book)"
A pastor, evangelist, missionary, and author, Clayton King has been dedicated since age 14 to proclaiming the gospel and calling Christians to live out the life of Jesus. He has spoken to millions of people in 30-plus countries, authored Dying to Live and Amazing Encounters with God, and helped organize missions to such places as Haiti, the Himalayas, and India. Clayton loves good books, the outdoors, strong coffee, dirt bikes and four-wheelers, and especially his wife and children. Sharie King is an artist, author, and popular speaker at youth and women's conferences. She has coauthored "12 Questions to Ask Before You Marry" with her husband, Clayton. Together with her pastor-evangelist husband, Sharie shares a passion to serve Christ through ministry, missions, and marriage, which she pursues by prioritizing being a wife to Clayton and a mom to their two sons.